I’m sure most of us will agree with me when I say that I find this tiny creature to be extremely annoying, the one that goes Bzzzzzzzzzz….SPLAT!! For a change I found it to be suitable enough to photograph. The way it sat relaxed on the 50th floor of the massive building was quite extraordinary. Or may be it looked fascinating because it was not inside the room to irritate me. 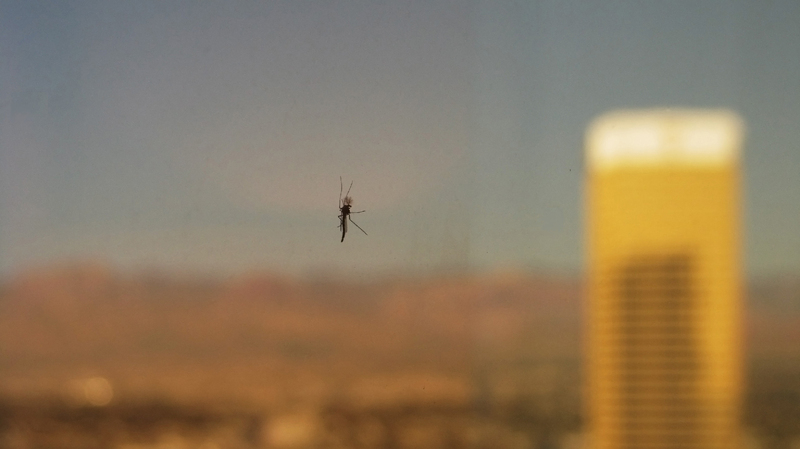 I immediately adjusted my camera settings to Aperture Priority mode to focus on the mosquito. The light were set to neutral. In photoshop contrast is increased using Levels option and noise is reduced by increasing the strength to “9″ and checking the “Romove JPEG Artifact” option. Removing JPEG Artifact removes the noise that enters the picture when it is qlikd from the camera. Since the window pane had some stains on it, I have used same color patch from the picture to cover it up. The patch is extracted using Rectangular Marquee Tool and is pasted on a new layer. And finally I used Smudge Tool is used to mix it well with the existing background.